Will eagles and lasers be able to save us from the next airport meltdown? A number of mysterious drones caused officials to completely shut down all of Gatwick Airport’s runways in London this week — and it highlights the uncomfortable fact that we have no idea what to do when drones show up unannounced at airports. The chaos started on Wednesday night, the BBC reports, when a commercial-size drone was spotted near Gatwick’s airfield, confirmed by about 50 sightings. During a two-day game of cat and mouse — the drone kept reappearing as soon as Gatwick decided to reopen its runways — more than 120,000 passengers and some 760 flights were affected by the disruption, according to the BBC. Local law enforcement believes it was a “deliberate act.” At the time of reporting, no arrests have been made. Possible jail time: five years, according to Transport Secretary Chris Grayling. It’s not even the first time a drones have disrupted the operations of an airport, as the AFP points out. 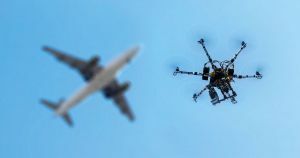 Drones caused chaos three times at Dubai International Airport in 2016, and an airline pilot avoided a crash with a drone in Paris in February 2016. So what can we do about drones at airports? When it comes to commercial drones near runways and other no-fly zones, security companies have invented “jamming” guns that cause drones to stop dead in their track, and even fall from the sky. For instance, Virginia-based security company DroneShield’s DroneGun can force a drone to land without even destroying it from a mile away by pointing a massive signal-jamming gun at it. Other methods include high-energy lasers that can obliterate small drones from several miles away. Police in the Netherlands have even tried using trained eagles to take down drones. The chaos at Gatwick chaos makes one thing clear: transport agencies and local law enforcement will have to come up with some kind of permanent solution in the future. Because traveling by plane this close to Christmas is terrible enough as it is.